In this second book of the series, narrated once again by Al's unnamed best friend, Al is faced with yet another difficulty of life with divorced parents. Her father is soon to remarry, and he wants Al to attend the wedding. As Al prepares for the impending nuptials, she also worries about getting her period, completing her needlepoint project, meeting her soon-to-be stepbrothers and finding a dress to wear to the wedding. After reading the first Al book, I was not prepared for how puberty-centric this story would be. But right in the first chapter there is talk not just of periods, but also of artificial insemination! I'm sure had I read this book as a kid, that would have gone right over my head, but as an adult it took me by surprise and made me see this series as possibly more mature than the first book suggests. Surprising content aside, this book has many of the same charms as a A Girl Called Al. I really like that the title character is seen only through the eyes of a friend. This approach works as well here as it does in the Horrible Harry series and in books like The Toothpaste Millionaire. Al's eccentricities would not come across half as well if the reader was inside her mind all the time. To appreciate Al, the reader needs to see her strangeness filtered through the viewpoint of an affectionate and sympathetic friend, and the narrator is both. I also love the little details of the girls' interactions, such as the way they tell each other to "have a weird day" each time they part company and their realistic behavior whenever they have disagreements. 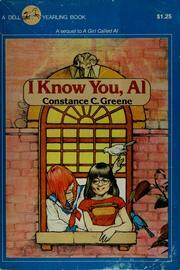 I also appreciate that this book shows Al's best friend interacting with another friend (Polly), as it adds layers to her character and shows how she acts when she isn't with Al, and also how her growing friendship with Al informs her behavior with others. Byron Barton's illustrations are also once again the perfect complement to the offbeat vibe of the story. They have a sloppiness and quirkiness to them that I just find so endearing. Though his pictures are decidedly not realistic, they do bring Al's personality to life quite well. At this point, I'm hooked on this series, for better or for worse. I plan to read and review the remaining four books, all of which are available on Open Library.